The Rubik Zone – I found one I can solve! 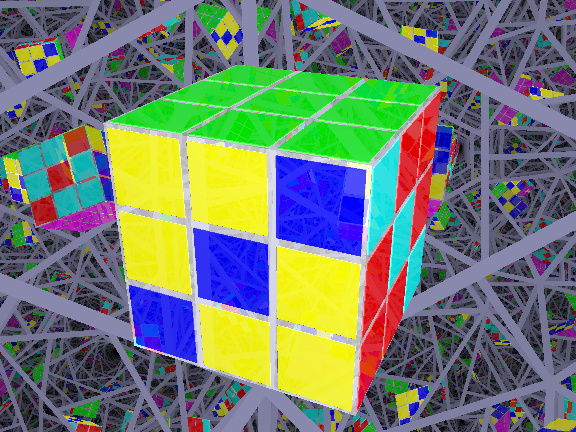 Welcome to The Rubik Zone, a site for all things related to the famous Cube of Erno Rube. I got my first rubik’s cube as a gift from my uncle. It looked cute and innocent – a bunch of brightly colored squares. A few twists later, and it was messed beyong repair, and stayed that way for months. Now, more than 20 years on, The Rubik Zone is here. Check out the menus to see what we have. More than 3 billion combinations! Over a hundred and twenty hamburgers sold! In actual fact, there are over 43 billion billion combinations. This is a number just a bit too big for most people to grasp. But it’s actually not as big as you might think. For example, it’s the cost of only 70,000 Iraq Wars, measured in Iraqi Dinars. Now 70000 is a number I can wrap my head around. you start buying Rubik’s cubes, messing them up, and posting them off to other people. Suppose you kept doing this until you had posted a cube to every single man woman and child on earth. Suppose also you persuaded everybody else to start doing the same. 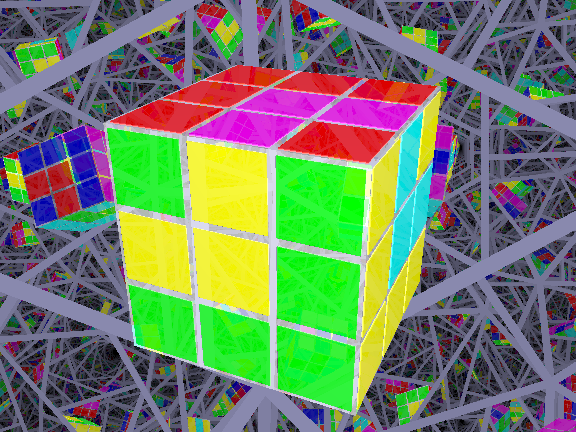 At the end of this, there would be just over 43 billion billion cubes lying around. And guess what? There’d be about a 2 in 5 chance that one of those cubes was actually solved, by pure chance. So it’s not as impossible as you might have thought! Unfortunately, all those cubes would cover the earth’s land mass to a depth of 15 kilometres. I suppose we could live on top of them and not worry about global warming any more (it’s pretty chilly 15 km above sea level). Or, we could ship them off to space. We could build a stack of them, 8 cubes wide and 8 cubes long, reaching clear to Alpha Centauri. Or just let them collapse into a big ball, 250 km across. Just imagine, a new, Rubik moon! It would have its own gravity – not strong, admittedly, but strong enough that a visitor couldn’t just jump off. The only problem would be that if it fell back to earth, the shock wave would flatten 90% of the trees and buildings on the entire planet. Anyway, check out the menus to find out how to solve the rubik’s cube – or cheat at solving it – or see what patterns you can make, or how to solve a cube of any size at all! Basically, this site doesn’t collect any personal information about you. Your privacy is safe. Certain specific parts of the sites may store information that you provide (as explained below), but no part of the site attempts to obtain information without your knowledge. The total number of visits to each page is stored. These aggregate statistics do not include any information that could identify you personally. The information is used to help make the site better for everybody. Certain parts of some of the sites do collect and store more personal information, but only if you provide it. Specifically, the polls store your responses, but this information doesn’t identify you personally, of course. Google’s use of the DART cookie means that the ads you see may depend on the websites you have visited in the past. If you would like to stop Google using the DART cookie on a particular computer, or you want to get more information about google ads and privacy issues, you can do so from here. Overall (not personal) information is collected using Google Analytics. Links to Amazon.com are connected to Amazon’s Associates program. If you are concerned about this, you should consult the privacy policies of Google and Amazon.com. 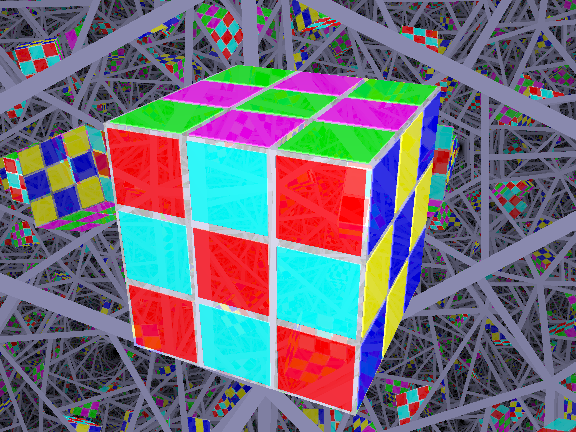 One of the nicest things about solving (or “differently solving” ) the cube is this – you get to make patterns! Rubik’s Cube Patterns are arrangements of the cube that have some nice symmetry to them. There are two kinds. 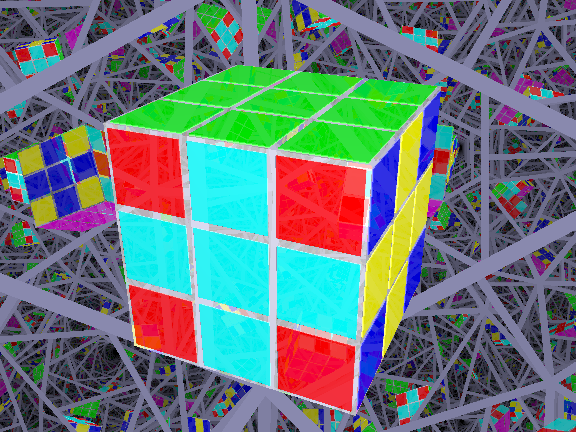 Some rubik’s cube patterns can be made by repeating the same moves over and over. So they are not only a pattern of pieces, but a pattern of moves. One example is the “Six Dots” pattern. Other patterns can’t be made by any obvious pattern of moves, but they still look very nice. An example is the “Cube in a Cube” Rubik’s cube pattern. Positions that are made by repeating the same moves over and over, or by apparently random sequence of moves, but otherwise don’t look that nice. 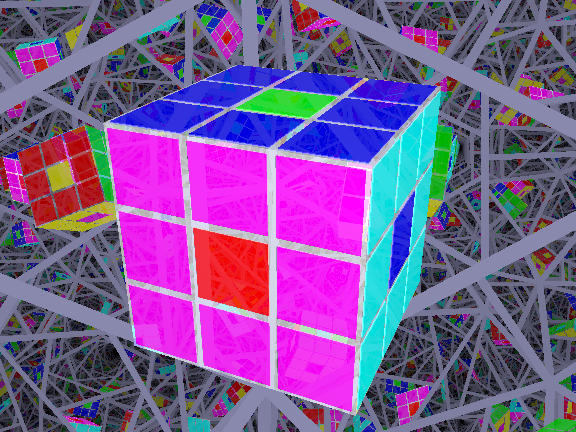 Among cube experts, this third kind of pattern is called “all messed up”. Below, I’ve listed a few of my favourite Rubik’s cube patterns. For each pattern, The link to each page contains a bigger picture, and also a movie showing how to make it. One of the classic Rubik’s Cube patterns, and one of the easiest to make, too. Here’s a nice simple pattern, with a fish on the top and bottom faces. It’s also easy to make. Another classic Rubik’s Cube Pattern, also known as six dots or snake eyes. This pattern is closely related to the Zig Zag, and is almost as easy to make. I’ll be adding more patterns to this list, so come back soon! The ‘Anaconda’ or ‘Snake’ pattern has a path, winding from face to face until it overs all six faces of the cube. I like it for two reasons. One – it has this nice unusual symmetry. Two – it’s hard to make. The video below shows the simplest method of doing it. You do a sequence of apparently random moves, turn the whole cube over, then ‘undo’ the sequence. Enjoy! Here’s a nice pattern that’s closely related to the Rubik’s Cube Zig Zag Pattern. It has four ‘plus’ signs going around the sides of the cube, the top and bottom faces are plain coloured. If you are lucky enough to have your white and red stickers opposite each other, one side of your cube would have the Swiss flag, the other the logo of the International Red Cross. This pattern is related to the Zig Zag pattern, because if you make a zig zag pattern, then turn the cube and make it again, you end up with this pattern. The movie below will show more details! This pattern is one of my personal favourites. It’s very easy to make, too. It looks like a zig-zag stripe running all the way round the side of the cube, with the top and bottom faces plain. Perhaps it reminds you of a drum? What’s more, the pattern is ridiculously easy to make. Turn opposite faces in opposite directions, 90 degrees. Then turn the whole cube. Do this six times. The movie below shows what I mean. You might also call this a chessboard or checkerboard pattern. It’s also one of the easiest patterns to make. As you’ll see in the video below, you just need to turn each pair of opposite faces by 180 degrees. This is one of the classic Rubik’s Cube pattern, sometimes also called “Snake Eyes”. It’s as if the central frame of the cube has been rotated by 120 degrees, around one of the corner pieces. This pattern is not so difficult to make. Just repeat this four times : Pull the central slice towards you, and turn the whole cube ninety degrees. Watch the video below, and it should become clear enough!